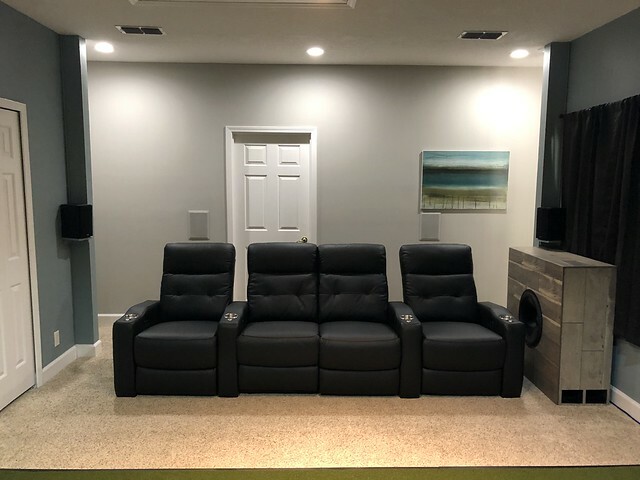 AVS Forum | Home Theater Discussions And Reviews > Home Entertainment & Theater Builder > Theater Room Items & Accessories > Current owners of HT seats with loveseats - any regrets? Current owners of HT seats with loveseats - any regrets? I want to get opinions from owners of front row of home theater seats with loveseat configuration. Any regrets about not getting a full row of seats each with individual armrests? I am in middle of planning for my room, planning on having only 1 row of 4 seats. I am a family of 5 with three very young children. The room will be just used for movie watching. I figure that a center loveseat configuration can fit the 3 small kids (or 1 adult with 2 small kids). Width of my room is 15' - so getting a five in a row seating configuration is not an option. Basement ceiling is 7.5" so getting a second row on risers also won't work. I probably will have bar table with bar stools behind 1st row for extra seating. 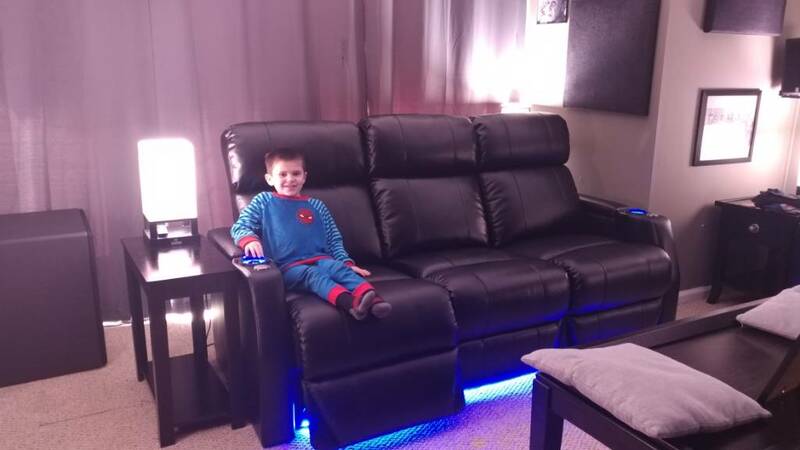 Anyone regret about getting loveseats? Should I just go with row of 4 seats, with bean bags in front for smaller kids? Depends on who is normally sitting in the seats. For my family, my wife and I love the center love seat section. We usually occupy the middle with our dogs and the kids flank us on the ends. It only gets a little weird if company is over. Id rather accommodate my family first. As said above, we enjoy our love seat with family. We also got a removable armrest when we bought the seats to use when others are over. I'm also thinking of getting a row of 3 with love seat in the future. My GF likes to cuddle when it's just us and who am I to discourage that! But also planned on getting the removable arm rest for when company is over. I say go with it. Also I'm planning on doing a riser and my ceilings are 7.5. It won't be a super high riser but doesn't have to be. Just enough. Thinking 6-8 inches high. I would love a second row with 8 inch riser except the back ceiling will have a hvac duct soffit, meaning that part of ceiling may be just under 7 feet. Granted the tallest family member is 5’9” (me), so it may all work -I’m still debating. Or I can go against all HT design basics 101 and get one row of 5 seats pushed against one side wall (no aisle space on that side). If you can do 2 rows of seats it will definitely be better especially in terms of getting optimal surround sound, but you can do one row of 5 seats as well. Check out our Jive-1013 recliners. These will fit your room. You can also go with full straight set of 5 with armrests in between IOIOIOIOIOI which is 142" wide, which will leave you with 38", and you would need to push the row of seats towards one of the side wall, and have one isle only. With the first scenario you can use our modular removable armrests as bubbrik mentioned. I'm planning on doing a riser and my ceilings are 7.5. It won't be a super high riser but doesn't have to be. Just enough. Thinking 6-8 inches high. RSH - I do like your suggestions. Can you PM me whether you have a showroom in NJ? I'll be visiting the area in April. Can you PM me whether you have a showroom in NJ? I'll be visiting the area in April. Due to space constraints I went with a sofa style row of three powered Pagets by HTmarket. I love them and have no regrets. Also, my setup is in my living room as well so that played a big part in my choice too. I think it's better to have the armrests but many people very happy with loveseat and sofa configurations. You could check our spacesaver options, we have HT Design Warwick and Belmont, belmont is a spacesaver with power headrest option. If your in chicago area you could come by and sit in all our seats. Both Warwick and Belmont row of 5 are 147.5", so that would leave you 33.5 inches or a row of 4 is 119". Thanks for your suggestions Alan, I'm really intrigued by Warwick, Belmont, and also your Sheffield. As helpful as your videos are, I wish I can try in person, but unfortunately I live in Massachusetts. No one lies down during a Cream concert. Passes out, maybe, but doesn't lie down. But it's too late I'm patenting this new yoga pose: "Sleeping Buddha In Home Theater"
I think you could do that, nothing is sacred, it's all personal taste. The sheffield is our newest seat, we get many orders from Mass and all over from folks who can't get here to sit in them. This thread is helpful for many and we have some good reviews on our site that are helpful to make correct style and configuration selections. is it sacrilege to get a 5-seater pushed against one side wall? My farthest seat on my left side will be about 7" from the wall. Maybe less depending on the tolerances when they actually finish building my seats. I can't imagine anyone who might sit there giving a hoot about surround performance. It is just my wife and I most of the time. If it comes down to me wanting to impress somebody, I'll sit in the seat closest to the wall and give up my money seat. We wanted four seats and also wanted a curved configuration. We went for what we wanted. Current Equipment: Datasat LS10 w/ Atmos and DIRAC. ATI 6005, AT527NC, Aerial Acoustics LR5's (LCR), Aerial Acoustics SR3's sides, Aerial Acoustics LR3's (rears), Seaton Submersive HP, Marantz VP15s1, 123" diag 16:9 Stewart Cima Neve screen, Oppo BDP-103. AC Power: Eaton whole-house surge protector at main panel, three dedicated 20 amp circuits, Surgex XR315 surge protector at equipment rack, Cyberpower 1400VA/900 watt, true sine wave UPS. Last edited by jdlynch; 03-26-2019 at 03:10 PM. That's a good point, the sound is probably most important only to me and not the young kids. Most of the time it'll be my wife and I watching movies only. Since I'm a family of 5 maybe I should go for row of 5 seats, with one end having adequate 2' to 3' aisle space, and the other end much closer to wall. I'm intrigued by a curved row of seats too, I know this configuration is even wider than straight seats, but end seats are curved. Visuals would improve for that person sitting at the end, but I wonder would that improve the surround quality in any significant way as well? If your row of seats is wider than your screen width, then yes the field of vision will improve with a curved row. Surround performance would probably be a wash compared to a straight row.